Kamelot have always struck me as kind of dorky, but the thing is, these guys embrace it which in turn makes their music fun. On this latest record the band is perhaps at their most polished - crafting immaculate masterpieces that leave nothing to question, using heavy synths and soaring vocals to roar out and showcase the bands sonic abilities. Here's a group who are fully aware of what they're capable of and push themselves to the limit, creating power metal that comes off as strangely serious and genuinely intriguing. The thing is, 2012's Silverthorn felt a little strange, merely because the band was only just starting to integrate their new vocalist Tommy Karevik. Now it feels like the band has really come into their own, fully using his capabilities and showcasing themselves not just as composers but musicians who know how to write to the strengths of each member. As Thomas Youngblood ages I get the sense that his compositions get increasingly epic in scale, and yet never can really be accused of being masturbatory. There is something distinctly tasteful about Haven and that keeps it refreshing as you explore its distinct soundworld. 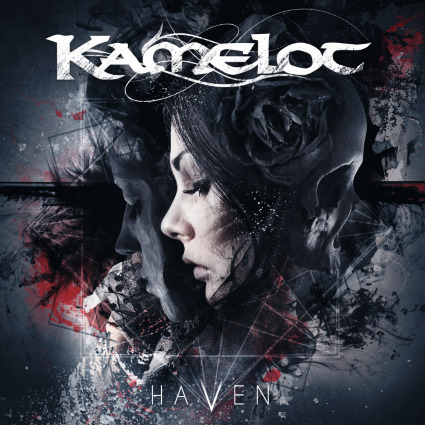 As you fall into Kamelots distinct grooves and feel yourself carried off by the bands powerful choruses it's hard to deny that Kamelot is the rare band who manage to stir up something in just about everyone. Unafraid to experiment (As evidenced with some of the nifty effects used in tracks like the instant classic Insomnia) Kamelot continue to prove themselves as modern day power metal masters. Let the music carry you away - these guys seem to have the will and the know how to take the world by storm!